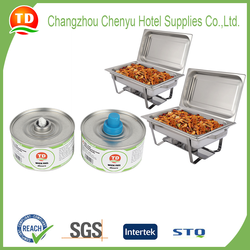 Sold by Changzhou Chenyu Hotel Supplies Co., Ltd. This product has already attained the ISO9001 international quality system certificate and reached European standards with European chemical REACH pre-authentication. • Application method Very simple, just light directly with the cigarette lighter or the matches. extinguishes with the cover when you do not use. Just the same use as spirit lamp. • Outward appearance Colorless transparent liquid state. Inside packed with tinplate can with inside and outside rust-proof anti-corrosion coating. Outside packed with high-quality special-purpose paper box for chemical products. 72 pieces / carton & Customized packed as your need. Shipped in 20 days after payment received. Choosing the trade terms FOB, CNF, CIF, DDU and DDP according to your requirements and clearance ability. Guarantee the goods arriving at you safe and efficient. Location of Changzhou Chenyu Hotel Supplies Co., Ltd.